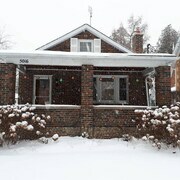 The property is located in a quiet neighbourhood facing on to a small ravine. The Downing Suite has a nice claw foot bathtub, comfortable bed, and faces West. I woke to a beautiful sunrise through the trees. I am here in Oshawa for a business meeting and this spot is much better than a hotel. The breakfast was healthy and tasted great. Where to find Clarington hotels near an airport? Where can I find hotels in Clarington that are near tourist attractions? Are you planning to spend time in Oshawa? 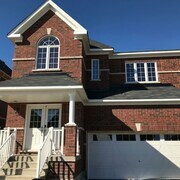 Hoping to find accommodation in the Clarington area? Within 0.1 kilometres (0.06 miles) of central Clarington you'll discover 4 hotels you can choose from. Our hotels within driving distance of Clarington include the Best Western Plus Bowmanville and Liberty Inn. 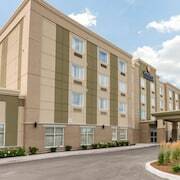 8 kilometres (5 miles) away from the heart of Clarington, is the Holiday Inn Express Hotel & Suites CLARINGTON - BOWMANVILLE. Alternatively, the La Quinta Inn & Suites Oshawa can be found 20 kilometres (13 miles) away. You could also choose to investigate the Oshawa Executive Suites or the Safari Lodge. After you've seen Clarington, take a little time soak up more of the Southern Ontario area. Photographers will appreciate Southern Ontario's beaches. In addition, you should go to a selection of the area's traditional villages, churches and art museums. 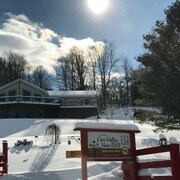 In this section of Canada visitors might also enjoy skiing. The closest accommodation options in Oshawa are Whitby and Ajax. Whitby is 30 kilometres (18 miles) to the west of Clarington, while Ajax is 35 kilometres (22 miles) to the west. 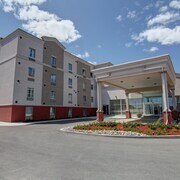 Whitby hotels and apartments are the Holiday Inn Express Whitby and Residence Inn by Marriott Whitby. 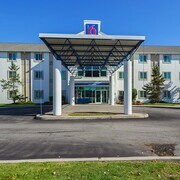 While accommodation options include the Hilton Garden Inn Toronto/Ajax and Super 8 Ajax Toronto Canada. Before you head home, why not spend an afternoon cheering along with local sports enthusiasts at a local sporting fixture. Air Canada Centre is 70 kilometres (43 miles) to the southwest of Clarington. Sports fans wanting to find accommodation near to the sporting action can select from the The Ritz-Carlton, Toronto or the Four Seasons Hotel Toronto. Pearson International Airport is a nearby airport for flying into and leaving Clarington. It is 85 kilometres (53 miles) away. If you choose to stay nearby, try the Sheraton Gateway Hotel In Toronto International Airport or Residence Inn by Marriott Toronto Airport. What are the most popular Clarington hotels? Are there hotels in other cities near Clarington? What other types of accommodations are available in Clarington? Explore Clarington with Expedia.ca’s Travel Guides to find the best flights, cars, holiday packages and more!